There are two kinds of Commercial Banks in Northern Cyprus, the banks which are the branches of large organizations based in Turkey and local banks. Many of these banks have correspondents in other countries. Transactions can be carried out in all currencies. The Central Bank of Northern Cyprus is responsible for the monetary, credit and exchange policy and acts as the banker to the government. All types of banking services are on offer in Northern Cyprus . 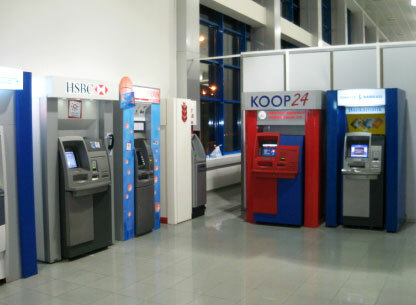 A number of local, Turkish and international banks all provide banking facilities and services in the key towns of Lefkosa , Kyrenia and Famagusta . Banking hours change between summer and winter however the large number of ATM machines available, ensure that cash withdrawal can be made 24hrs a day. Northern Cyprus local currency is the Turkish Lira however most supermarkets, restaurants, hotels and petrol stations are willing to exchange foreign currency using exchange rates quoted in the local newspapers. UK sterling, EU euros, Cyprus pounds are all readily accepted. Residents or individuals wishing to set up a bank account can do so in either Turkish Lira or in UK sterling. Investors should be aware that transferring funds to Turkish banks may require considerable time unless the transfer is done to a UK branch of the bank concerned. Below you can find a list of established banks in North Cyprus. All the banks have a brunch in every main city of North Cyprus. Is Bank is one of the biggest bank of Turkey. You can use Is Bank for their excellent Internet Banking options. Garanti Bank is also one of the most popular Bank in Turkey. Garanti Bank also has very useful internet banking system. HSBC North Cyprus HSBC is known as the world's local bank, to be here in North Cyprus. Turkish Bank has a several branches in capital Nicosia, Kyrenia and Famagusta. Have branches also in London, Harringay and Dalston. IktisatBank, main bank is in capital city, Nicosia but have a brunches all over North Cyprus.